There have been lots of twitter sightings of Ryan Gosling in New York. Tonight it seems that Ryan and his date took in a show on Broadway. 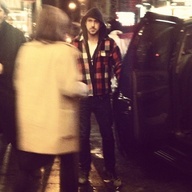 Ryan was seen today at the Gerald Schoenfeld Theatre on Broadway. From the picture it looks as if Ryan is holding the door of the car ... ever the gentleman!! The show Glengarry Glen Ross is showing at the theatre - hope they enjoyed the show!